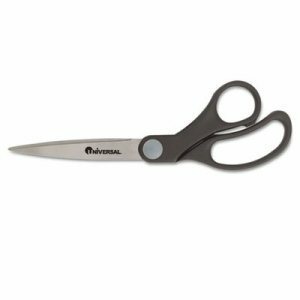 UTILITY SCISSORS Sunbeam brand utility scissors Stainless steel blades with black plastic - handles - red rivet 61181 KITCHEN SHEARS SIZE:8-1/2"
All Purpose Kitchen Shears go from one task to the next without complaining. 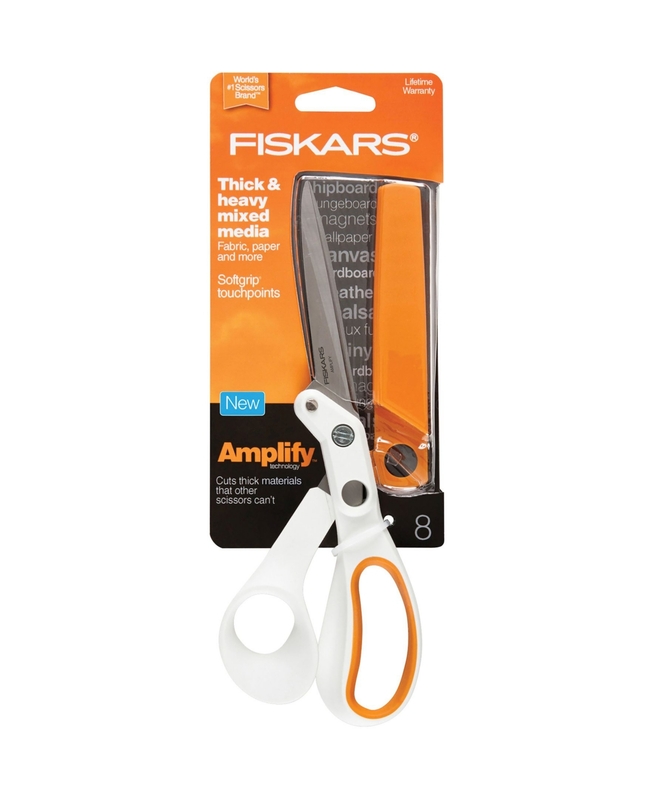 A serrated blade edge grips for precision no matter what you're cutting and sculpted handle loops with Softgrip touchpoints bring Fiskars' hallmark comfort to every use. Plus a take-apart dishwasher-safe design makes post-meal cleanup a cinch. Stainless Steel Plastic. Orange Grey This item cannot be shipped to APO/FPO addresses. Please accept our apologies. 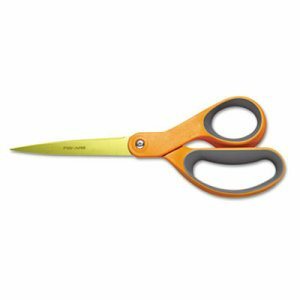 Amplify Shears Craft 8" Amplify Shears Craft 8"
White & Orange finish 8" Amplify Craft Shears with Amplify technology senses blade separation when cutting thick materials and forces the blades back together for crisp clean cuts every time. The floating blade tang transfers energy to the torsion bar which adjusts the blade to its optimal angle. 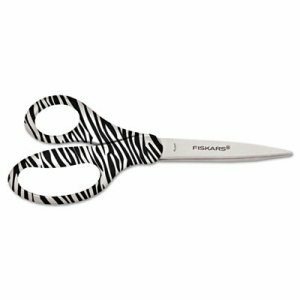 Sharp stainless steel blades hardened steel with a precisely honed edge cut cleanly all the way to the tip and stay sharp. Exceptional comfort thumb and finger loops with advanced ergonomic sculpting to fit the shape and natural movement of the hand. Softgrip touchpoints enhanced comfort and control. Protective sheath keeps shears safe and protected. This item cannot be shipped to APO/FPO addresses. Please accept our apologies. Patent-pending CarboTitanium� blade-bonding technology, one of the hardest titanium-surface treatments available. Industrial-strength blades easily cut through multiple layers of fabric, cardboard, canvas, vinyl magnets and more. Blade surface will not chip, flake or peel, giving these scissors an incredibly long life, performing as well as they did on the day that they were purchased. 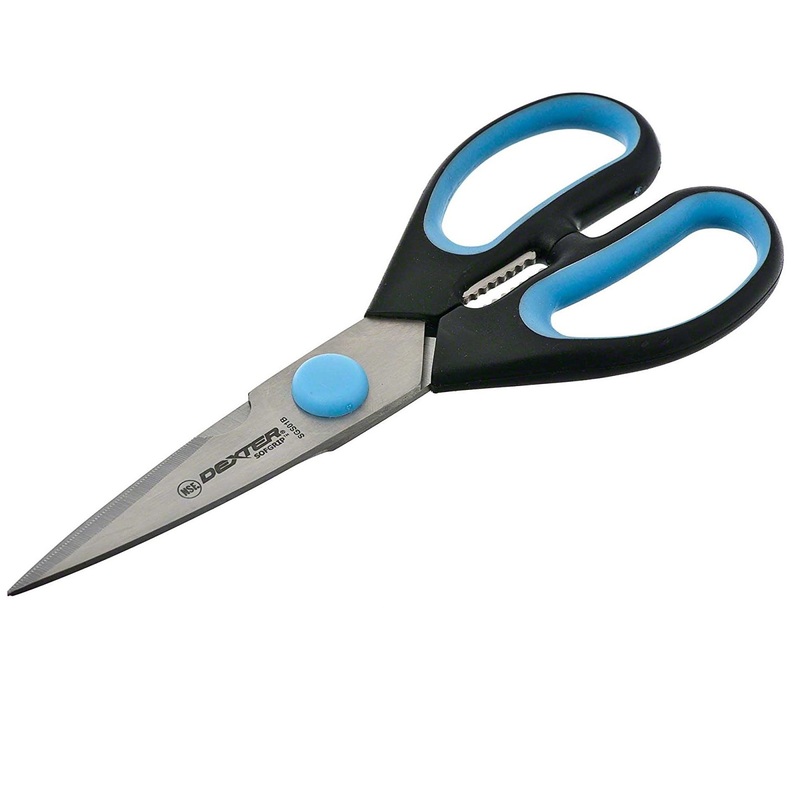 Cut Length: 3 1/4"; Scissor Length: 8"; Tip Type: Rounded; Handle Type: Straight. Patent-pending CarboTitanium� blade-bonding technology, one of the hardest titanium-surface treatments available. Industrial-strength blades easily cut through multiple layers of fabric, cardboard, canvas, vinyl magnets and more. 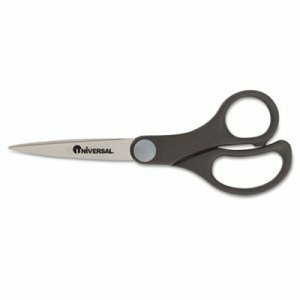 Blade surface will not chip, flake or peel, giving these scissors an incredibly long life, performing as well as they did on the day that they were purchased. 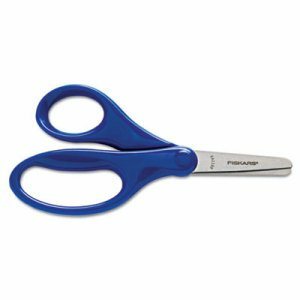 Cut Length: 4 1/2"; Scissor Length: 9"; Tip Type: Rounded; Handle Type: Bent. 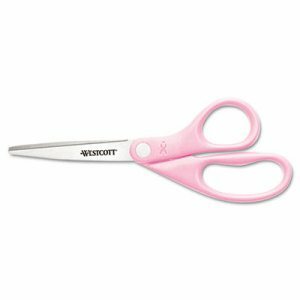 Short precision-ground, stainless steel blades and a safer cutting angle make these scissors perfect for children. Comes in assorted colors for added style! Cut Length: 1 3/4"; Scissor Length: 5"; Tip Type: Rounded; Handle Type: Straight. 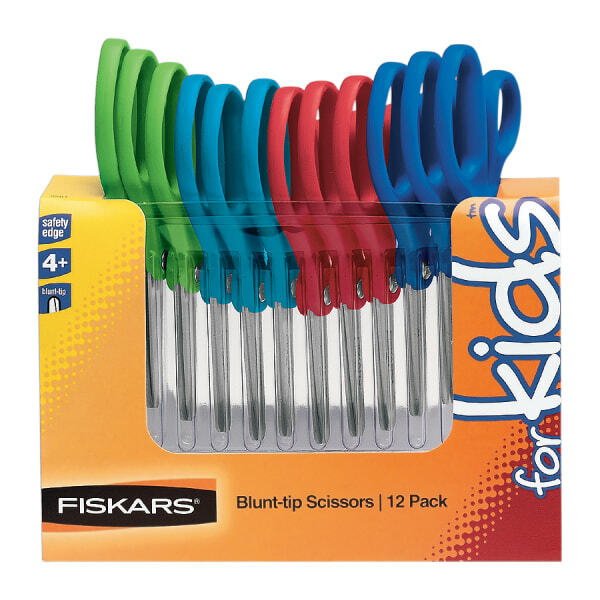 Short precision-ground, stainless steel blades and a safer cutting angle make these scissors perfect for children. Comes in assorted colors for added style! 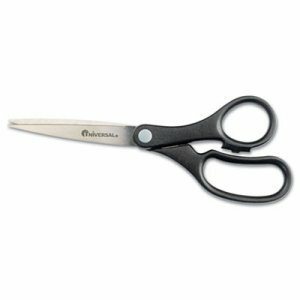 Cut Length: 1 3/4"; Scissor Length: 5"; Tip Type: Pointed; Handle Type: Straight. Specifically designed for completing office tasks. Blades are made from the highest grade materials for durability and cutting accuracy. Handles designed for improved control and reduced fatigue. 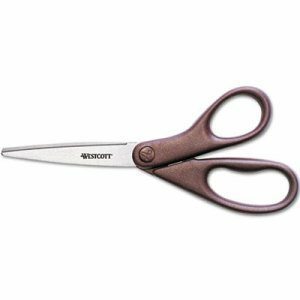 Scissor Length: 8"; Tip Type: Pointed; Handle Type: Straight; Scissor Type: Scissors. 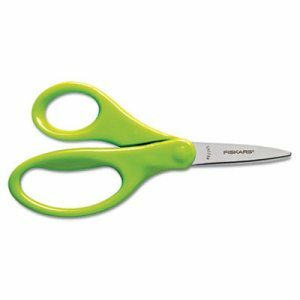 308 5PC Set All Purpose Kitchen Scissors 5 convenient sizes to fit kitchen projects large or small. 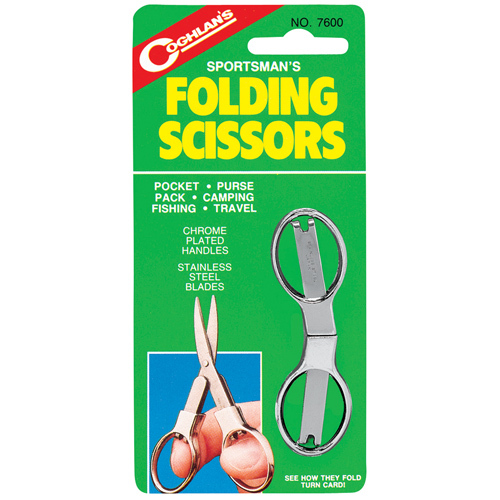 Blades are fabricated in durable stainless steel with easy grip handles. 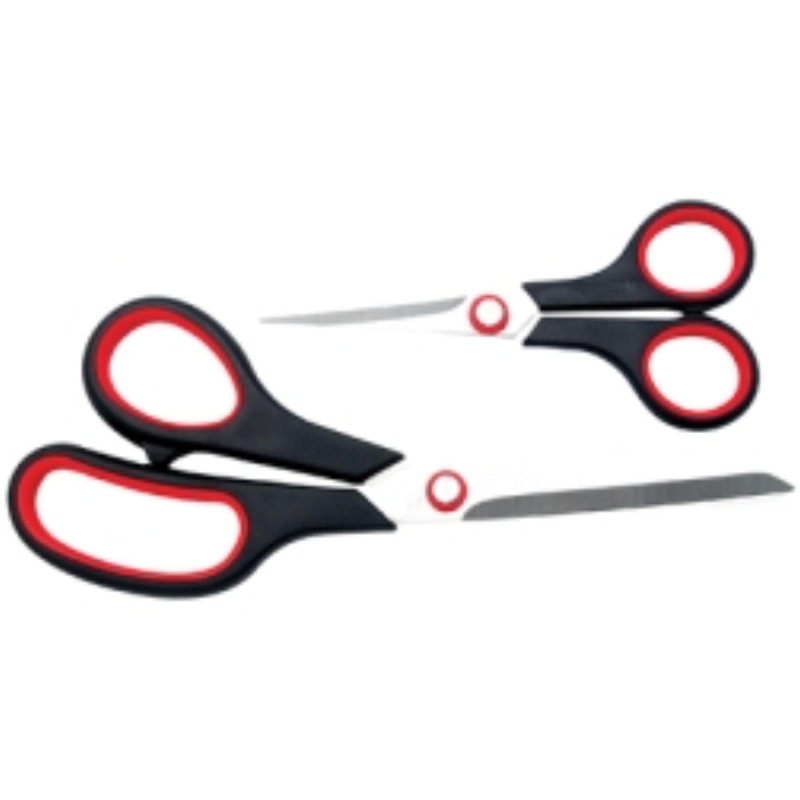 �Scissors set includes 5-1/2”, 6-1/4” 7-5/8”, 8-1/2” and 9-1/3” . 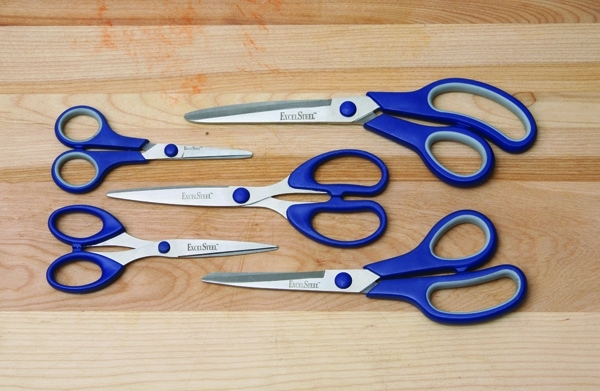 All-purpose scissors ideal for office environments. 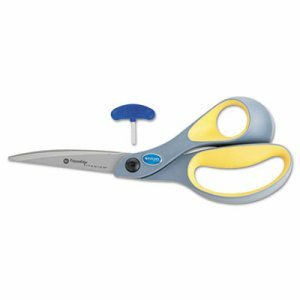 Tough, stainless steel cutting blades guarantee long-lasting performance and precision. Cuts through a variety of materials, from paper to cardboard. 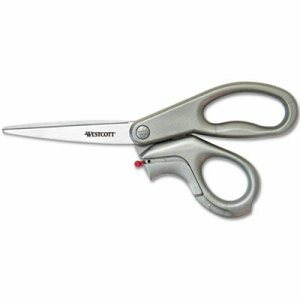 Cut Length: 3 3/4"; Scissor Length: 8"; Tip Type: Pointed; Handle Type: Straight. Scraper and file on outside of both blades. Screw-hinge permits adjustment. 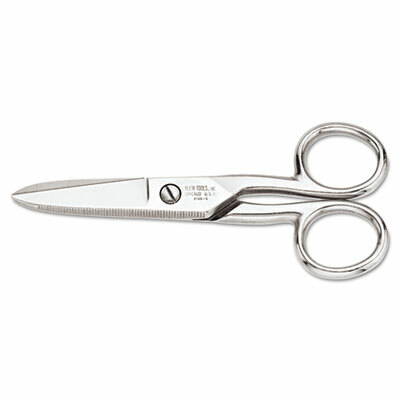 Scissor Length: 5 1/4"; Tip Type: Rounded; Handle Type: Straight; Scissor Type: Shears. 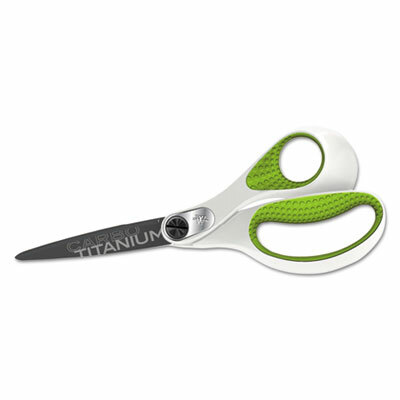 Titanium-bonded scissors with comfortable contoured soft grip handles can cut through multiple layers of even the toughest material. The adjustable screw allows you to adjust the cutting tension. 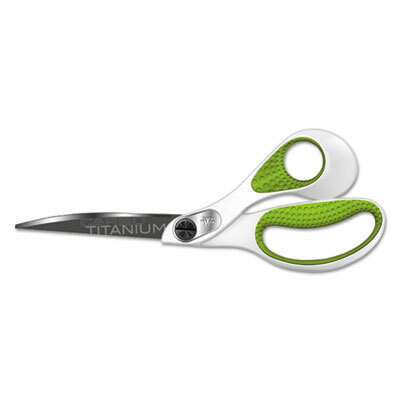 Provides three times the strength of stainless steel scissors. 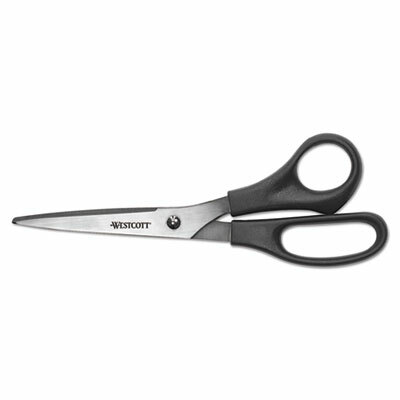 Cut Length: 4 1/2"; Scissor Length: 9"; Tip Type: Rounded; Handle Type: Offset. 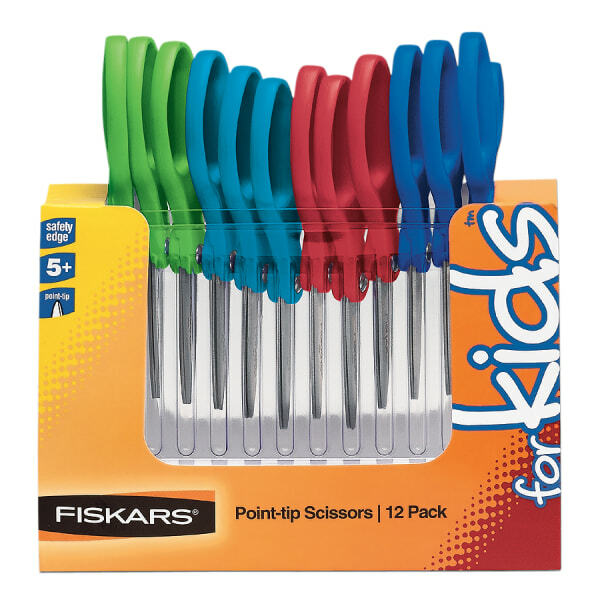 Convenient, time-saving 2-in-1 scissors and box cutter. 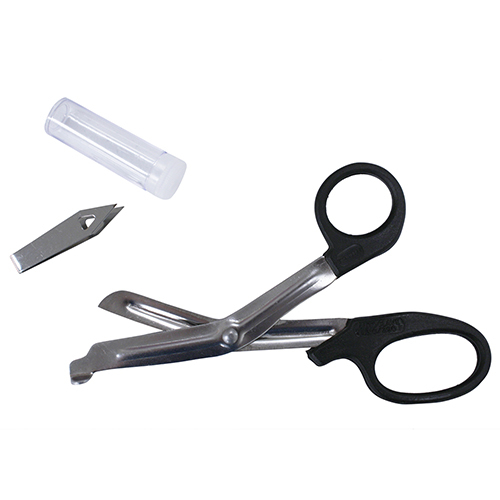 A simple trigger release extends the box cutter blade�it retracts when pressure is released, making the opening of boxes quick, easy and safe. 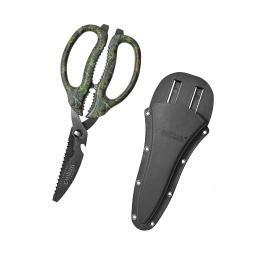 The stainless steel, corrosion-resistant blades ensure a long-lasting, durable tool. Other features include a pointed tip, gray handles and left or right-handed capability. 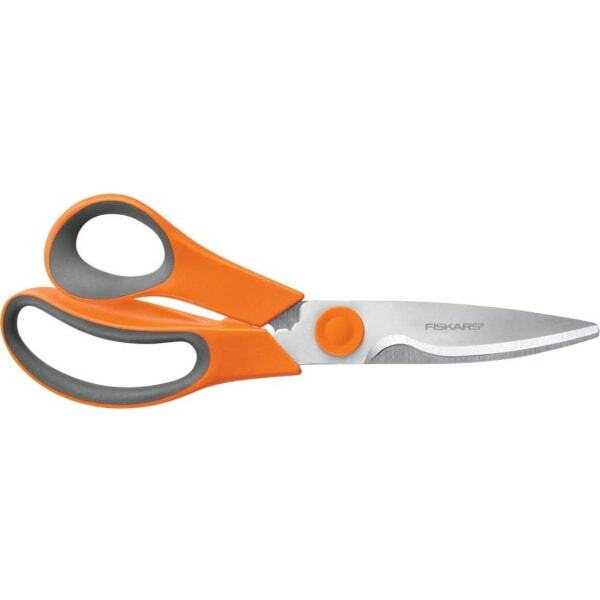 Cut Length: 3 1/4"; Scissor Length: 8"; Tip Type: Pointed; Handle Type: Offset.